Who's Still Using Older Macs? "Apple grabbed 6.6 per cent of the US personal computer market during Q1 on the back of a leading year-on-year 32.5 per cent jump in unit shipments, research company Gartner said yesterday. "Third-placed Acer saw shipments drop 18.3 per cent between Q1 2007 and Q1 2008, resulting in its share of the US market falling from 11.5 per cent to 9.1 per cent. That's just 2.5 percentage points ahead of Apple...."
"Apple's growth rate in terms of Mac shipments in the first quarter outpaced that of the other top five U.S. PC makers, a research firm said Wednesday. "Apple shipments soared by 32.5% to 1 million units, compared with the 762,000 Macs shipped in the same quarter a year ago, Gartner said. Apple ended the quarter with a 6.6% market share that placed it No. 4 among the top vendors in the U.S."
"IT hates the Mac. The explanation as to why has always been up for debate: IT is slow to adapt; IT doesn't like diversity; IT is masochism disguised as a career; IT people want to keep their jobs; etc., etc. Whatever the reason, the Mac has always been the leper of corporate tech. "But the times they are a'changin...."
"What has changed to make the Mac fit better IT can embrace that Mac momentum, not just tolerate it, thanks to several shifts in computing that make the Mac a better enterprise fit than in the past - first and foremost being a rising threat to Microsoft's other mainstay in the enterprise desktop environment, Internet Explorer. "Firefox, which has risen in popularity to account for 16.8 percent of browser use on the Web, according to Net Applications, as of December 2007, has broken IE's stranglehold on Internet app delivery, which it had maintained through ActiveX controls. Because Microsoft never released a version of IE for Mac OS X, Mac users were frozen out of ActiveX-based Web sites, making many SaaS (software as a service) offerings and enterprise-app Web clients off limits to the Mac." "Who out there is still running old hardware on a regular basis?" Link: Who's Still Using Older Macs? 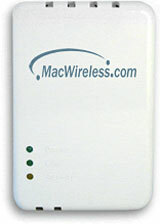 PR: MacWireless has announced the release of a new ultra-fast powerline network adapter for Macintosh. Powerline networking allows you to route your network through the electrical lines that are already built into your home or office. With speeds up to 200 Mbps, this is a great way to get your Ethernet network to other floors or rooms in your building, without the need to run wires. Powerline Network Adapters are particularly useful when concrete, metal, or other obstructions in the walls of your home or office block your wireless signals. Please see below for details. Sharing broadband internet access around the home or office. Sharing printers, scanners and other peripherals. Transferring and sharing files between computers. Powerline Networking devices convert data from your computer into a signal that can be transmitted over standard AC wires. The signal does not interfere with the ordinary current traveling through the wires. You simply go Ethernet into one adapter and take Ethernet out of one or more adapters in different outlets. Powerline adapters use your existing wiring as an Ethernet extension cable. Up to sixteen Powerline Networking devices can be used on a network. Powerline Networking networks can run over up to 980 feet of electrical wire at a maximum speed of 200 Mbps. Network Adapters will operate on any version of Mac OS 9 or Mac OS X, and will also work with Windows. There is no driver to install and no software is required for operation. Ideal for connecting wireless access points on multiple floors or in distant rooms. PR: Addonics Technologies has announced its Snap-In series, a family of enclosures that allows users to hot swap hard drives between systems by just popping out the drive. 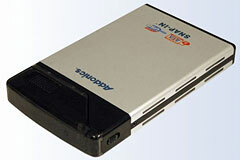 The Addonics Snap-In ExDrive25 is the simplest portable 2.5" hard drive enclosure solution available. 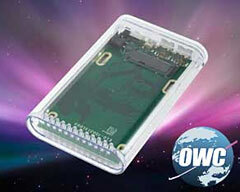 Any 2.5" SATA hard drive can be installed in this enclosure without tools or mounting screws. The Snap-In ExDrive25 acts just like a hard drive reader/writer. Users can hot swap hard drives between systems at any time. The Snap-In ExDrive25 is constructed of aluminum for durability and efficient heat dissipation. A patented shock mount mechanism is built-in to protect the hard drive from damage. The device includes dual eSATA and USB 2.0 connectors for easy desktop-to-notebook connections. The Snap-In ExDrive25 is also bootable under eSATA to make it excellent for disaster recovery. 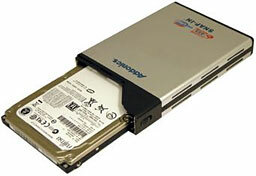 Addonics new Snap-In Double Drive for desktop systems has twin 2.5" SATA hard drive slots. To remove a hard drive users just "snap" open the drive door and pull out the hard drive. It fits inside a standard 3.5" drive bay. The Zebra Snap-in Mobile Rack, may be the only external drive enclosure you will ever need. It is offered in eSATA or eSATA/USB models. When attached to a system via the USB 2.0 or a hot swappable eSATA port, hard drives of any capacity can be added or removed from the system as easy a popping out a cassette tape. The Addonics Snap-In enclosures support Windows, Linux (Kernel 2.4 and above), Mac OS X and above with a USB connection. The eSATA connection adds support for DOS and Solaris 10 and above. The MSRP for the Snap-In ExDrive enclosure (AE25XSNESU) is $29. The Snap-In Double Drive (AE25SNAP2SA) is $39. Zebra Snap-In Mobile Rack with eSATA / USB 2.0 interface (ZSNESU) is $77. Snap-In solutions are available through the Addonics online store, major catalog companies, resellers, VARs and distributors, including PC Connection, CDW, Buy.com, Provantage.com, Insight, and Ingram Micro. Addonics Technologies Inc. designs, manufactures, and markets a broad line of external and mobile storage products. Addonics is headquartered at 1918 Junction Ave, San Jose, CA 95131, Phone: 408-433-3899. PR: Other World Computing (OWC), a leading Mac and PC technology company, today announced lower pricing on its award-winning Mercury Elite-AL Pro "Quad Interface" storage drive line of up to 1 TB for the best value on the market. The Mercury Elite-AL Pro Quad Interface storage drive provides high-speed maximum performance with a wide selection of connectivity options for FireWire 800, FireWire 400, USB 2.0, and eSATA ports, for easy Plug 'N Play compatibility on virtually ANY computer system. Priced starting at $155.99, the Mercury Elite-AL Pro "Quad Interface" storage drive line features the fastest single drive transfer rates possible, exceeding an amazing 80 Megabytes per second via FireWire and up to 150 MB per second via eSATA. Geared to those that want a convenient, compact single drive solution with a selection of interface options, the storage drive is ideal for audio, video, digital photography, professional music, and graphics applications. In addition, the Mercury Elite-AL Pro is also perfect for backup and is EMC® Retrospect® Backup Certified. High Performance: employs the next-generation high-speed Oxford 924 chipset combined with the fastest drive mechanisms available for the fastest single drive transfer rates possible, exceeding an amazing 80 Megabytes per second via FireWire; up to 150 MB per second via eSATA. High Reliability: a topnotch design and high-quality components ensure it's built to last. The Mercury Elite-AL Pro Quad Interface storage drive line comes complete with utility and backup software, including IntechHard Disk SpeedTools Utilities for Mac OS 8.6-X, ProSoft Engineering Data Backup for Mac OS v10.2.8 or later and NovaStor NovaBACKUP for Windows 2000 or later. It also includes all the cables for FireWire 400, FireWire 800, USB 2.0, and eSATA interfaces. The drive is compatible with all Apple® OS Versions 8.5 through 9.2.x; Apple OS X 10.0.3 and higher (including OS X "Leopard" 10.5.x), Microsoft® Windows® ME, 2000, XP, Vista; and any OS or device with FireWire®, USB, or eSATA. Mercury Elite-AL line also includes FireWire 400+USB Combo and the FireWire 800/400+USB 2.0 "Triple" models. PR: Corsair, a worldwide leader in high performance computer and flash memory products, announced today the launch of their new Corsair high-density Memory Line for Mac Pro desktop systems. Made especially for the high performance demands of the Mac market, the new Corsair Mac Pro Memory Kits are fully buffered 667 MHz solutions, available immediately in 2 GB (2 x 1 GB modules) and 4 GB (2 x 2 GB modules) DIMM kits. The Corsair Mac Pro memory modules are qualified at the Apple Test Labs in California and are 100% compatibility guaranteed with a lifetime warranty. "We are excited to extend our Corsair memory solutions to support the high performance Mac Pro Desktop Systems," said John Beekley, VP of Applications at Corsair. "These modules offer end users the ability to greatly maximize the amount of memory in their Mac Pro," added Beekley. In addition to the new Corsair Mac Pro desktop line of memory products, Corsair also recently launched the first high performance memory modules made especially for Mac laptops. The new Corsair memory modules are the industry's first low latency modules specifically tuned for the new Apple MacBook and MacBook Pro laptop computers. The new Corsair Memory Line for the Mac Pro is immediately available through Corsair's authorized distributors and resellers worldwide priced at $165 for the 2 GB kit and $225 for the 4 GB kit. Corsair memory products are backed by a Limited Lifetime Warranty. Complete customer support via telephone, email, forum and Technical Service Xpress is also available. PR: Prosoft Engineering, Inc., the developers of easy-to-use, award-winning utilities, today announced that the latest version of NetWare Client for Mac OS X now fully supports Apple's Mac OS X Leopard operating system. "Prosoft is dedicated to continuing support for NetWare environments. NetWare Client for Mac is now compatible with Mac OS X 10.5 (Leopard)," states Greg Brewer, President and CEO of Prosoft Engineering. Availability: NetWare Client 2.0.1 for the Mac OS is available for purchase online. PR: Try the brand new recovery solution for Mac. You cannot afford to lose all information on your computer. Lost productivity can be devastating! Rescue Kit for Mac OS X Lite restores your system to its original state and rescues sensitive data enabling you to be up and running. It can safely and easily backup both Mac and Windows data to any media, including USB, FireWire and network storages. It does what it says - and comes to the rescue. Easily avoid the need to reload or re-image your system with enhanced recovery features for unparalleled protection: you can restore your data without having to install any additional software, even Paragon Rescue Kit for Mac doesn't need to be installed! Bootable Recovery Media Perform a full backup/restore and/or file/folder rescue even if your operating system cannot be booted. File Transfer Wizard Get complete access to any file system (even if they are unmounted or corrupted). Data Backup Safely and easily backup both your Mac OS and Windows OS and data to any media. Individual File/Folder Restore Built-in image browser to quickly find and restore individual files and/or folders. Network Support Easily backup and restore from any accessible network. Backup to any media Backup vital data to any media, including USB, FireWire devices or network shares. All file systems are supported Get access to the most commonly used file systems (FAT 16, FAT 32, NTFS, HPFS, EXT2FS, EXT3FS, Reiser, including Apple HFS(+)). Easy-to-use Intuitive, easy-to-use Wizards handle the most common and even complex tasks.